Boiled cider — apple cider boiled until it's thick as molasses — lends its wonderful flavor to these tender, moist cake doughnuts. Better still, the doughnuts are made with 100% whole wheat flour; and they're baked, not fried, so no need to stand over a pot of spattering oil. A thick maple (or cider) glaze is the perfect final touch, but feel free to simply dust with cinnamon-sugar instead, if desired. 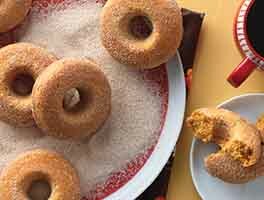 Recipe update: Thanks to reader feedback, as of 11/30/17 we've reduced the salt in this recipe and increased the boiled cider/applesauce, both to improve the doughnuts' flavor. 15 mins. to 18 mins. 30 mins. to 38 mins. *For apple cider glaze, see "tips," below. Preheat the oven to 350°F. Lightly grease two standard doughnut pans. If you don't have doughnut pans, you can bake these in a standard muffin tin; they just won't be doughnuts. Beat together the oil, eggs, sugar, applesauce, boiled cider, vanilla, cinnamon, salt, and baking powder until smooth. Fill the wells of the doughnut pans nearly to the rim; use about 1/4 cup of batter in each well. If you're making muffins, fill each well about 3/4 full; the recipe makes about 15, so you'll need to bake in two batches (unless you have two muffin pans). 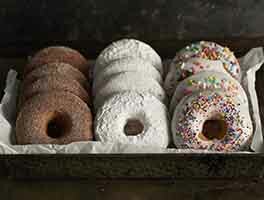 Bake the doughnuts for 15 to 18 minutes, or until a cake tester inserted into the center of one comes out clean. If you're making muffins, they'll need to bake for 23 to 25 minutes. Remove the doughnuts from the oven, and loosen their edges. After about 5 minutes, transfer them to a rack. While the doughnuts are still warm (but no longer fragile), gently shake them, 1 or 2 at a time, in a bag with the cinnamon-sugar. If you've made muffins, sprinkle their tops with sugar. Allow the doughnuts or muffins to cool completely before glazing. To make the glaze: Mix together all of the glaze ingredients, stirring until smooth. Spread the doughnuts with glaze (or dip tops in glaze); return to the rack until the glaze is set. To make apple cider glaze: Follow the maple glaze instructions, substituting boiled cider for the maple syrup, increasing the sugar by 1/4 cup, and omitting the maple flavor. The maple glaze formula is written for real maple syrup; if you use imitation syrup, start with 2 tablespoons instead of 3; artificial syrup is thinner than real syrup. Made this in mini muffin pans. Followed revised directions exactly. Did not overlook. Was very disappointed in taste and texture. Wanted to try recipe out before I purchased donut pans....Glad I did. Sorry to say not a winner for me! 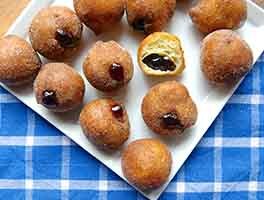 I have made this several times--I use my mini-muffin tin to make something more like donut holes than donuts--they bake in about 10-12 minutes. ALSO--if you want to change up the glaze a bit--I have done the glaze with some of the boiled cider, a bit of maple syrup, and enough powdered sugar to make it the right consistency. It just makes the donuts have a much stronger apple flavor. I eyed this recipe for a week before making the cider. Then I decided I needed to get a donut pan and do it right. Glad I did! The donut shapes are so nice- the edges are crisp and they are fun to eat. I made both glazed and recommend the apple cider one. It makes the whole thing taste so interesting. Mine look like a mess- the cider glaze was harder to work with than the maple glaze. I spread the glaze on- next time I will dip them. Thanks for a great recipe. Just finished my second warm "donut"! We love them! Mixed KA WHITE WHEAT and KA UNBLEACHED ALL-PURPOSE flour. Used our baby bunt cake pan, 1/4 C batter in each section for 13 donuts wih a bunt cake flair. Maple sugar for the sweet topping. 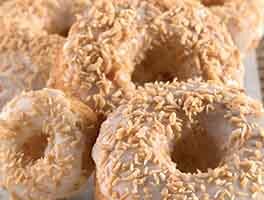 Made these donuts for the first time this morning, and they were fabulous! Next time I'll add the maple glaze, but even without itand rolled in the cinnamon and sugar, they were the perfect sweetness. Lots of apple flavor, too! Will be making again! Delicious and very easy to make, but I'll make a few tweeks for next time - a bit less sugar, a bit more boiled cider, and a touch of nutmeg. And I used the apple cider glaze. Super easy, super delicious. I used the Boiled Cider and the doughnuts were so good. Light and tasty, not heavy or greasy. Loved them! These were AH-MAZING! We had some leftover apple butter and used that instead of boiled cider, but think it would've turned out about the same either way. Super light, not an overpowering taste, and not super sugary. Rose perfectly and were less dense than a store bought cake donut.